Oh, Lord. Grant me the wisdom on this day to make pancakes in your image, the image of your son Jesus Christ, or the image of the blessed mother, Mary. Guide my hand on the path from the bowl of buttermilk pancake batter to the perfectly heated and buttered griddle. Steady my arm as I flip each pancake, and am careful not to leave them cooking on one side too long so that they burn, ruining any of the aforementioned potential divine images. And guide my eyes to the platter of cooked pancakes, so that I might recognize that I have created not merely a breakfast food, but something sacred, before I drown it in syrup and eat it with a side of link sausages. But if you can't grant me that wisdom, maybe you could grant me the wisdom to make it in the image of one of the apostles. Paul maybe. Or Simon. No one ever talks about Simon. But I don't know what he actually looks like, so maybe you could identify him on the pancake as well, so I don't accidentally get Simon and think it's Michael Douglas or something. 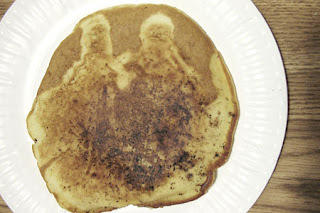 I mean you are God, so I think you are perfectly capable of guiding me to recognize the person on my miracle pancake. Hey, no need to get snippy, God. I know you've got a bazillion other things going on, like stopping bullets from hitting arteries and casting your image into church picnic Jell-o salads. But if you would just do me this one little favor, I would really appreciate it. If that's too much, maybe just a grilled cheese sandwich would do. Thank you for inspiring the Mayor to write this post. It is most excellent. P.S. The Virgin Mary grilled cheese is my favorite.